Time has flown and it hardly seems like yesterday since we wrote our last newsletter. Our lives are in God’s hands who holds the times and seasons. True certainty only lies in Him and not in the shifting sands of this life. This month we were concerned to hear that Di’s father was taken to hospital after experiencing, what we were told was, a silent stroke. He has been improving but with some memory loss. We asked many to pray for his healing and for God’s intervention in his life. We thank the Lord for his improvement and we continue to pray for him. On the same day that Di’s father was taken to hospital we received a call from Celani. 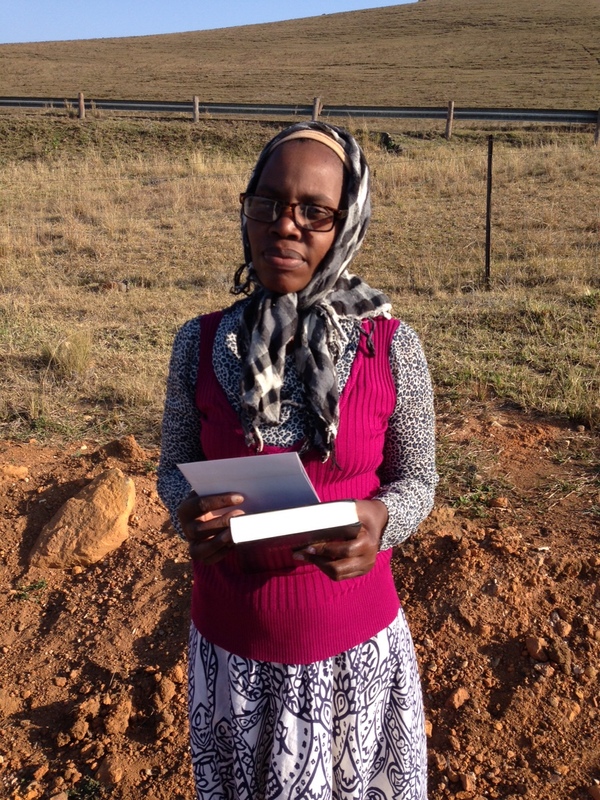 Zanele, a 19 year old girl, who just gave her life to the Lord recently, had collapsed after severe headaches. We rushed her to the hospital and they ran some tests on her. The hospital staff at Vryheid Hospital were very helpful. She was diagnosed with migraines but with no cause discerned. After she was discharged she still continued to suffer painful migraines. She was taken to another hospital who gave her more injections and she has since seen a reduction in migraine attacks. 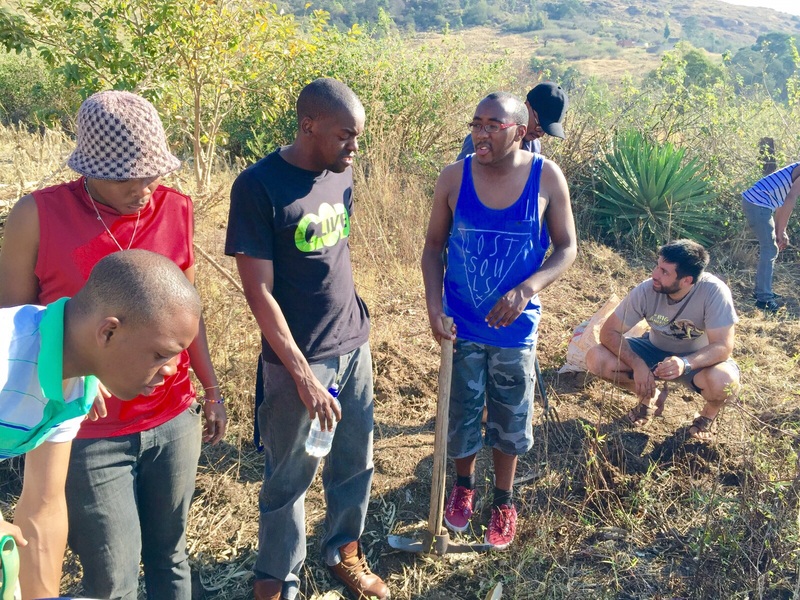 Phumlani has stood the trial with making a stand concerning the ancestral tradition with his family concerning the rituals that his family wanted to do for his dead mother. Instead his family went to the grave site and “told her” that they would have to do the ritual at their home as Phumlani would not allow them to do so in his home. They said that they understood that Phumlani follows the Bible. The issue of church discipline is still in process. 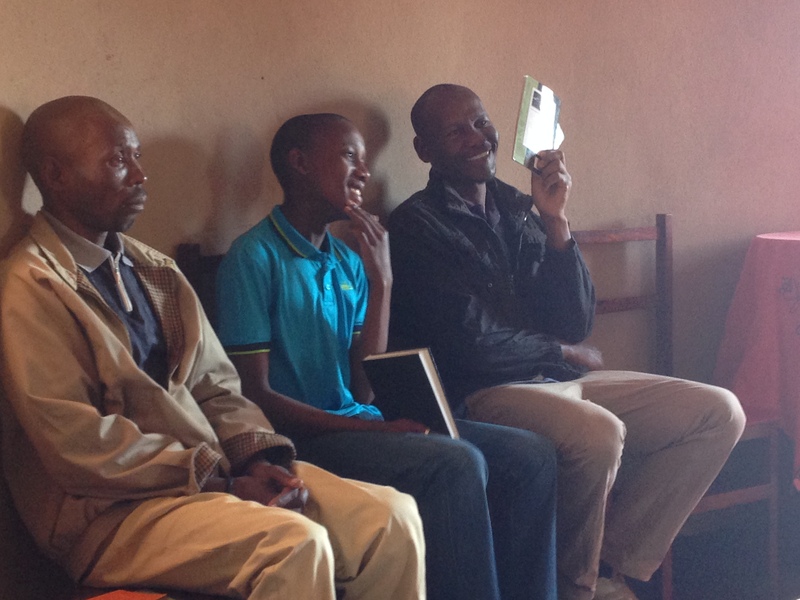 Salvador has been following up and offering advice to the church member who we are desiring to restore. 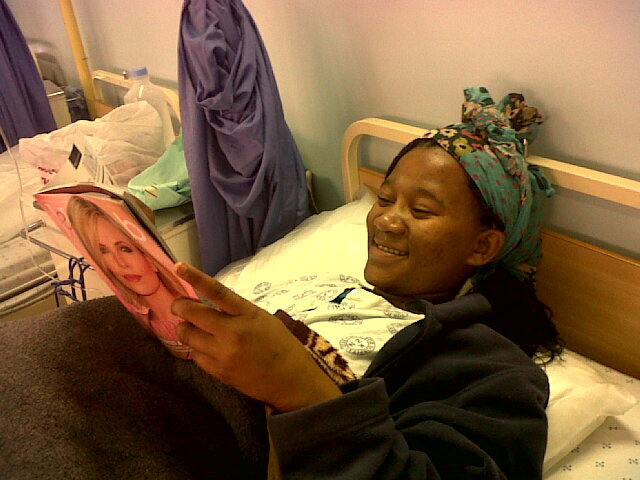 For a couple of months Di has been visiting an old age home in Vryheid on Wednesday. Through getting to know one of the ladies staying there, who has family in New Zealand. Di has had a little opportunity to share the word with her and we trust that she will gain more opportunities in the future. 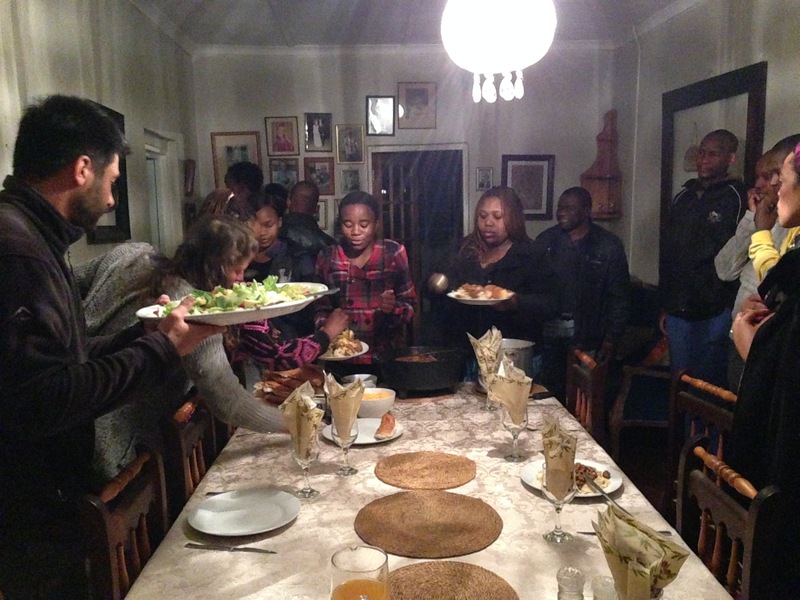 Early in the month we had 15 young adults/teens visit us from Lyndhurst Baptist Church, Gauteng. 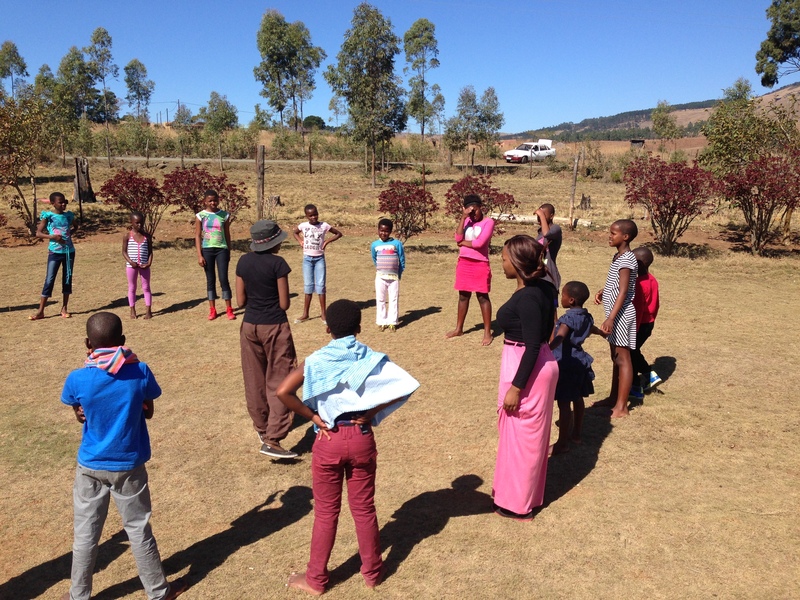 They desired to get involved with as much activities as possible over a week end. 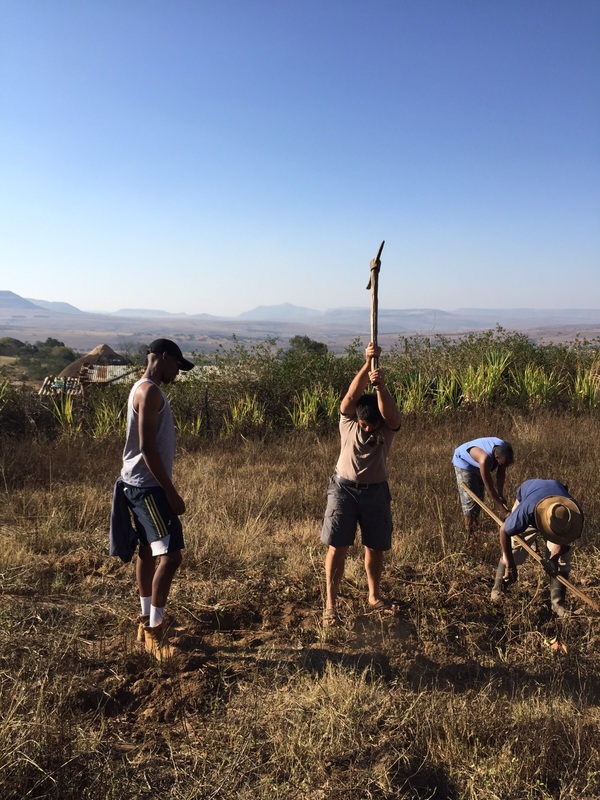 They taught kids club and distributed food parcels, while others helped Mkhulu dig up his sweet potatoes. The Saturday evening we all went to Johnny and Kim’s place for cell group. On Sunday we all attended the church meeting, after which some went to Mkhulu’s place to continue digging up sweet potatoes. Other young people waited at our place to teach some of the local children but, despite our invitation, none of them turned up. So they went to deliver more parcels in the local community. One of the places the young people visited was a local crèche, called Sicelo crèche, which used to be housed in a mud hut but since they have had a proper building built for them. 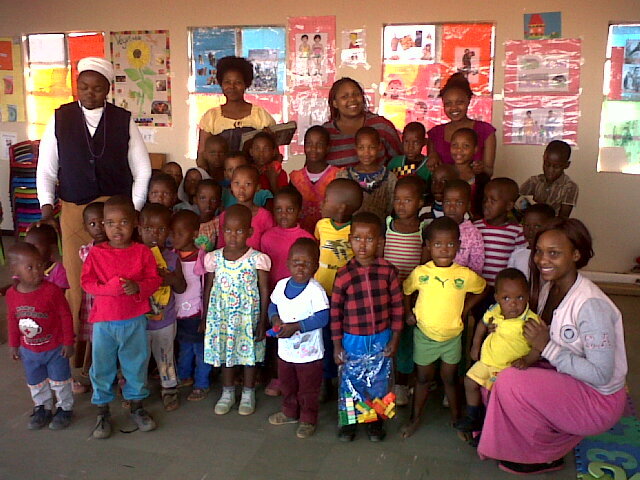 It is wonderful to see the enthusiasm of Khanyisile, the young lady who started the crèche. Such passion is rarely exhibited in our local community. Some other of the young people went with Salvador to catch the tail end of the funeral of the local chief. Salvador had visited the chief’s family to pay his respects the previous week. The local chief, BM Zulu had welcomed Salvador into the community when he first arrived with Caleb and Sophie Massey in 2002. The news of his death had come as a shock, especially after learning that he had died in hospital after having some kind of serious illness. At the funeral, Salvador and the young people with him saw Chief Mangosuthu (Gatsha) Buthulezi sat at the head table. He was supposed to give a speech, but because they did not address him with the correct honorary title in the program of events, he refused to give a speech. Apparently, young people today are supposed to know how to use a computer, therefore there was no excuse for them making such mistakes in today’s day and age. 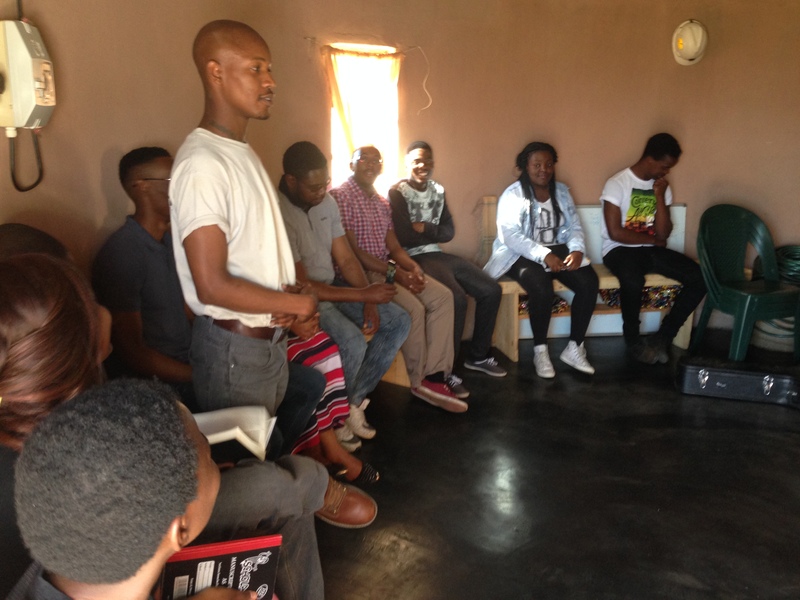 After the funeral they went to fetch Siphamandla and did the evangelistic bible study (using New Tribes Mission material) in the area of Esihlengeni with MaKhumalo. Salvador has been doing the study at the truck because the family have not allowed us to meet inside the homestead. But the father of MaKhumalo’s children, Thanda Mtshali, came through today, after having drunk much alcohol and convinced his family to allow us to do the study in the home stead. Instead of continuing with the lesson we ended up dealing with relationship issues. Thanda and MaKhumalo are not married and he needs to pay the bridal price before they are entitled to get married (according to the culture). Salvador challenged him concerning his drinking and to start joining the bible study by which he will learn the truth that will set him free. Please pray for Thanda. We do not know whether he will take up the invitation. Salvador has started teaching the older kids at Kid’s club. It has been a challenge to communicate the simplest of truths to them. Unlike previous years there is more parrot fashion repetition of answer and far less comprehension so we are taking things even slower with them. Di taught care bear Creche and Salvador has started teaching Victory school once a month. We have been invited back to teach the kids at Joyland once a month again, so we will be doing that in the coming week. Our toilet has been leaking for a long time. Salvador hasn’t been sure how to fix it. He has put wax seals in them numerous times but they never hold it for long until it leaks along the bowl. We are a long way from town and so getting a plumber out would entail a lot of work for to redo the whole system. However, Di had to keep soaking and bleaching the towels put down to soak up the leakage. Upon some advice Salvador opted to buy a flexi pipe and sawed off the current pipe. But alas, the flexi pipe could not fit as the toilet is too close to the wall. Therefore, he took the pipe apart, shortened it, then glued, silicon sealed and put putty in it. There is a minor leak in the pipe but this drips into a container, and the drip is not bad. This means that we need not put towels down as before and the whole thing is holding nicely. At the end of the weekend we went to Gauteng, and stayed with Mark and Paula Hibberd in Krugersdorp, outside Johannesburg. We were supposed to visit our friends Jozua and Veronica on the way there, however, we started to have car trouble as we heard a chugging sound coming from one of the wheels. It got progressively worse by the time we reached Utrecht. 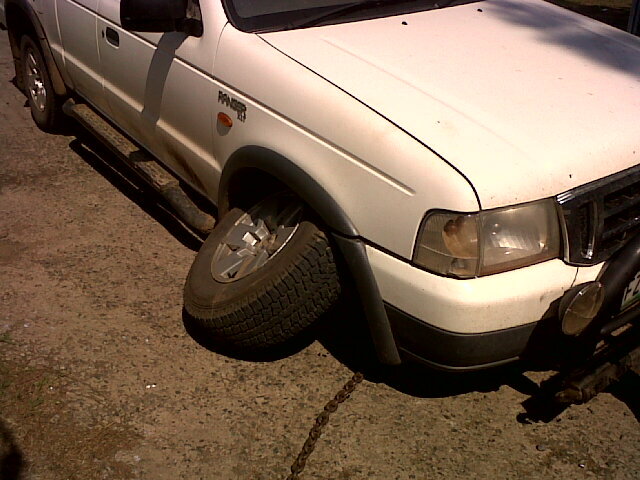 We found a mechanic who said that it was the wheel bearings but there was no chance they could get the part delivered to Utrecht that week so we had to drive another 50kms till we reached Newcastle. On the way, not only the chugging sound continued but there was some screeching and the steering started playing up a little. Di kept asking Salvador, what that sound was. Salvador, concentrating on driving and keeping a consistent speed of 80kmph, told Di, “I don’t know, stop asking and keep praying!” When we got to Newcastle we asked at two places for a mechanic that was available to do the work before we found a breakdown service. When we were round the corner near the breakdown service, the steering had become very stiff but we found the breakdown service and managed to get to the gate but as soon as the front wheels got to the gate the wheel bearing collapsed and the car stopped. 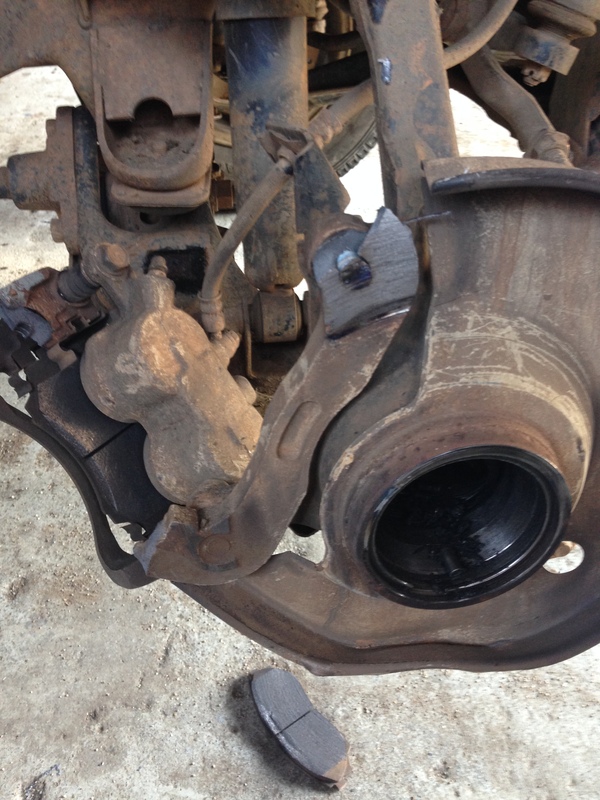 Salvador got out of the bakkie and walked over to a dumbfounded mechanic who had stopped and stared at our vehicle, and said, “We have arrived!” The brake calliper had snapped but they managed to find a cheap replacement at the scrap yard. The guy said we were lucky we lasted till we got there and we were lucky to have gotten a brake calliper at the scrap yard. We told him that it was not luck but the Lord! So we were able to make the journey to Krugersdorp that afternoon to get there in the evening. The point of the visit was to conduct a preliminary interview with a lady saved out of necromancy and occultism. She is one of the people Salvador will be using for his outreach project to help people get saved out of ancestral traditions. We were blessed by the interview and thank the Lord for her testimony. Jean (not her actual name) will need to have her identity disclosed as she is preparing to be a missionary in a muslim country and therefore cannot jeopardize her ministry there. While staying in Krugersdorp, our friends, Riaan and Debbie as well as their son and his friend came to visit us. Salvador went to a boys home with Mark and shared his testimony which helped to confirm some of the truths that he and a friend, Tyrone, have been teaching the boys there. At the end of the stay there Salvador started to get a flu, and now we are both recovering. The first Friday back Salvador started a series on the Holy Spirit which was a great encouragement to those who attended. This next month we are pleased to say we will have David Nathan of Bread of Life Ministries www.bolm.co.za who also is the administrator for Moriel Ministries in South Africa. He will be teaching our Zulu church and the home cell on being filled with the Holy Spirit. We will be visiting Ballito again in the beginning of October so that Salvador can get some help and advice in conducting his project concerning ancestral traditions. More news will be forthcoming. Please pray for Marg Godwin (Moriel Administrator in Australia) who has been having health issues. Ministry and evangelism in the area. Outreach project on Ancestral traditions. In the last chapter we saw this paradox: God shows His grace to Gentiles and they accept it but God has held out His hands to the Jewish people continually but they have been obstinate and stiff necked. So God has hardened them. This paints a bleak picture of Israel’s purposes in God’s salvation plan. How will Paul address this dilemma? This chapter is the culmination of Paul’s theological teaching on the Gospel and its implications on the Jews. In the next chapter Paul moves onto the practical outworking of the Gospel. But this chapter is a humbling chapter. It sobers us up to a point where we cannot take our salvation for granted. It should challenge us in our view of Israel so that we should be deeply saddened that many of them do not believe the Gospel. It should make us marvel at God’s wisdom in His plan of salvation. Up till now we have been looking at this epistle from the point of view of the Jews; what they would have thought and the objections they would have had. We have seen how Paul has answered them by demonstrating that the Gospel does not contradict the Old Testament, but on the contrary the Old Testament testifies to the Gospel. Now in this chapter, for the first time since Romans 1, he specifically addresses the Gentiles again. What is the Gentile attitude towards the Jewish nation? Often it has been anti-Israel. The common teaching, not only in the apostate Catholic Church, but also in the writings of the early Church Fathers, as well as in Protestant churches, has been that Israel is guilty of Jesus’ blood. They place this guilt on the Jews because they say the Jews crucified Jesus. So, therefore, God has done away with Israel and instituted the Church. In other words the Church has replaced Israel. This is a half truth. It is partly true because Israel, on the whole did reject their Messiah and bore much responsibility for His death, but it is also lie because Israel never actually crucified anyone. Rome crucified Jesus. Just because Pilate said I am innocent of this man’s blood and the people said, ‘His blood be on us and on our children’, does not make him innocent of the blood. Yes, the Jews rejected Jesus but so did the Gentiles. The fact that Jesus told Pilate that the Jewish leaders had the greater guilt implies that Pilate also bore some of the guilt. The difference between Jew and Gentile is that Israel is God’s covenant people, whereas we Gentiles were aliens to the covenants. Because of that fact, Israel had greater culpability. But it was Jew and Gentile together that crucified Messiah. Jews did not crucify, rather they were supposed to stone those found worthy of death. Jesus could not have been stoned for at least two reasons. Firstly, stoning was a symbol of the condemnation of the Law (the Law being written on tablets of stone). Although Jesus took the curse of the Law, He had not broken the Law. He did not die as a law breaker but as a propitiatory sacrifice. The reason He had to be crucified was because Jesus had to become a curse for us so that we would be free from the curse. Cursed is anyone who hangs on a tree. But secondly, it had to be by crucifixion because it is a picture of Jesus dying for the sins of the whole world. Jesus died at the hands of Rome, the leaders of the Gentiles and he was handed over by the leaders of the Jews. Whether Jew or Gentile it was still my sins that sent Jesus to the cross. We will look at this chapter in three sections. Firstly from verses 1 – 10 we will look at the election and the hardening of Israel. Secondly from verses 11 – 24 we will see the reason for Israel’s hardening, and finally from verses 25 – 36 we will look at the fulfillment of God’s plan of salvation. Paul uses a diatribe, an imaginary voice of doubt and objection, to deal with potentially opposing arguments. At the end of Romans 9 and in Romans 10 Paul asserted that God has extended His hand out to the Gentiles and they have accepted the Gospel but God has striven with Israel and they have been stubborn and obstinate. If what Paul asserted is true then does that mean that God has finished with His purposes for Israel? This is the seemingly superficial conclusion that one would make from reading Romans 9 and 10. Some people make this claim, even though we saw that Paul has already said that God would save a remnant, even though Paul has said that there is no distinction between Jew and Greek, and even though God is abounding in riches for all who call upon Him. But let us, as Paul does, take this superficial misunderstanding of what Paul has just taught. If Israel, on masse, has rejected the Gospel then surely is it not symptomatic that God has rejected and cast them away? They killed Jesus, they rejected the Gospel. Salvation has come to the Gentiles and therefore we can say that the Church has replaced Israel as God’s covenant people. What is Paul’s opinion to this question? May it never be! If God has finished with the Jews, then we would have no Apostle Paul because Apostle Paul was Jewish. Some people think that Paul was called Saul before his conversion and then became Paul after his conversion. Thus, his Jewish identity was rejected. But after Saul was converted he was still called Saul. In fact the Holy Spirit called him Saul when He called him to ministry in Acts 13:2. It was not until Paul started his missionary journeys in Acts13:9 that Luke starts to refer to him with the name Paul. This says more of Paul’s identification with the Gentiles for the sake of the Gospel than it does of Paul’s conversion. Paul was Jewish through and through, but never gloried in it before God. The fact that Paul was saved was a living testimony to the fact that God had not finished with the Jewish people. Despite their unfaithfulness to God as a nation, God was still faithful to them. The nation does not deserve it. The nation turned away from the Lord but God does not do away with the whole nation. Rather He shows grace to a number who do not bow their knee to a foreign God. It is not because of their goodness or their works but because of God’s grace. In the dispersion of the Jews, the judgment brought about by Nebuchadnezzar was not only against the idolaters from among the Jews. It was not only the faithless of Judah that went into captivity but it was also Daniel, Shadrach, Meshach and Abednego. But from this present judgment of hardening, that Paul writes about, God keeps a remnant. When we read the word ‘choice’ or ‘election’ in verse 7 we must remember that this ‘election’ is defined by Romans 9:8. The ‘election’ refers to those who are of the promise and not those of the flesh. Throughout the scripture God is always separating. In the creation God was continually separating. He separated light from darkness, water from water, land from ocean and day from night. Throughout the bible we see God separating Abraham from his country and then from his family and then lastly from Lot. Then God separates Ishmael and Isaac, then Esau from Jacob, then Judah from his brothers. Then Solomon’s kingdom was split into two and then finally we got to the one who was separated from everyone else, Yeshua Hamashiach (Jesus Christ). Think about those rejected for a moment. The people that God has striven with, whom He gave His commandments to, whom He promised His new covenant to, for whom Jesus wept over, God has given a spirit of sleep. So, in verse 10, God, as part of that judgment, causes them to be in a position where they cannot perceive the Word of the Lord. It will become a closed book to them. What Paul is doing in these two verses is showing a common theme between verse 8 and verse 9. God has given a spirit of stupor because Israel had rejected God as the true ruler over them. They did this because, as Moses had already said, God had not given them eyes to see or ears to hear. But in verse 9 Paul quotes David who is praying God’s judgment on those who were persecuting him in Psalm 68:23. This psalm is a messianic Psalm and speaks of the crucifixion of Christ. So put these quotes together and what do you have? You have in the first instance a rejection of God by the Jews and in the second a rejection of the Messiah by the Jews. Therefore God has hardened them. Think about this. Because the Jews acted religious yet rejected God as being in command of their lives, God hardened them even though they had such a privileged position before Him. But how many times have we treated God in the same way? We have treated Him as someone who will be happy with our Sundays and Wednesday nights but we have not trusted in Him in our life decisions, nor even consulted Him. We have treated Him as if He cannot see what is going on and does not know. But we are still in Grace. Such a revelation should hit us and humble us, should cause us to walk in fear of the Lord. What God did with the nation of Israel is drastic. Yes, Jews that are born again are saved, but the rest who were hardened must have gone so far that it seems that they are beyond recovery. When Paul says that Israel has ‘stumbled’ he means that Israel has sinned. Surely Israel have not sinned to such a point that they are beyond recovery have they? Therefore, though God has saved individual Jews as part a remnant, He must have finished with Israel as a nation, right? Wrong! Paul says that they are not beyond recovery. Paul gives two major reasons for Israel’s hardening. We have already seen the cause, which is Israel’s rejection of their God and Messiah. However Paul shows us that God has two purposes in it. Firstly, in verse 11, Paul says that Israel’s hardening has brought salvation to us Gentiles in order to make Israel jealous. We looked at this in the last chapter. But what we did not stress is the impact that Israel’s hardening had for us who are Gentiles. In our case the children did not only drop crumbs on the floor for us to lick up but they dropped the whole loaf. Their transgression is riches for the world. We did not belong, we were aliens and we were classed as dogs. But because of Israel’s sin, obviously not referring to the remnant that Paul has mentioned, we are now classed as children. This is our privilege. But Paul saw this as something bigger than Gentiles being saved. He saw this as part of the fulfillment of God’s promises to the nation of Israel. Thus, there is God’s second purpose. God wants to bring Israel to a full hearted repentance to their God and Messiah. It is only when you lose something dear to you, then you realize how precious it actually is. Israel was nominal and religious but she lacked reality. God would provoke the Jews to jealousy and make them realize how they made God feel with their idolatries. He would do this so that he may bring them back with a full heart. This has a benefit for us Gentiles. Paul’s argument in verse 12 says, if Israel’s sin and failure brings riches to the world, how much more riches to the world will their fulfillment bring? One primary way that Jews bring riches to Gentiles in their salvation is when a knowledgeable Jew gets saved, he brings out riches from the word. When we look at the book of Ruth from the point of view of the history of Israel and the church, we see a demonstration of this precious truth. Ruth attaches herself to Naomi at the beginning and through Naomi’s instruction she meets the kinsman redeemer, Boaz. Then for a night she is separated from Naomi at the threshing floor with Boaz, speaking of a gentile church suffering with Christ, but then Boaz sends Ruth back to Naomi with 6 loaves of bread. This speaks of the gentiles taking the gospel back to the Jews and Naomi upon receiving the six loaves of bread tells Ruth what they mean. We Gentiles have taken the Gospel back to the Jewish people and after seeing many saved we are receiving riches of meaning of the word. These riches of the word do not contradict the Gospel message we have received but in fullness that we never before realized existed. People like Jacob Prasch and Arnold Fruchtenbaum enrich us with insight of the word. What Paul wants to get us away from is an arrogance that just because Israel has been hardened does not mean that He has finished with them. Rather He plans to bring them back from the dead as it were, like their Lord. Look at verse 16. If Abraham, Isaac and Jacob have been set apart, so have all their descendants too. In KwaZulu Natal a number of Zulus would ask ‘why did God pick the Jews?’ They were inferring another question; ‘why did He not pick the Zulus?’ But this is the question that everybody asks. The Gentiles look at the privileges Israel had in scripture and their being called the apple of God’s eye and so on. So they ask, ‘Why them Lord, why did you have to pick them?’ The Jews look at the Babylonian captivity and the Holocaust, the progroms and the inquisition and they ask, ‘Why us Lord, why did you have to pick us?’ Paul demonstrates this truth by looking at the example of the olive tree. Note what he says about the tree. There is one olive tree and many branches. There are natural branches and there are wild branches grafted in. Some people see this as referring to the nation of Israel and the Gentiles as a collective. I believe it is dealing with individual Jews and individual Gentiles for the following reasons. When it refers to the natural branches it refers to them as plural branches and according to verse 17, not all of them were cut off. That is some were cut off and a remnant was left. Secondly, when we Gentiles were grafted in, we were grafted in among the natural branches, that is born again Jews. Verse 17, again, speaks of a number of Jews being on the tree. Therefore the branches represent individual Jews and Gentiles. Also God threatens that the Gentile might be cut off if there is unbelief, which cannot be true of the body of Gentile believers, but only individual believers. And lastly in verse 19 Paul gives the argument of a Gentile who says that the branches were cut off so that ‘I’ may be grafted in’. He does not say that ‘we’ may be grafted in. In other words we are individual branches. Yes there has been a hardening of Israel but remember this, the covenant you are in is Jewish at its core. The cutting off of Jews was for a reason and not merely because God desired it to be that way. The reason Paul gave for their rejection is their unbelief. Our inclusion is based on our faith and the continuance of our faith. Paul explicitly teaches us that we must not think that we are beyond being cut off. To teach, at this point in the scriptures, it is impossible for someone to forfeit their salvation is to undermine the force of Paul’s argument. Paul says that we stand by our faith, the just shall live by faith, we are saved by faith and we are being saved by faith. He tells us not to be conceited but to fear. If God did not spare the natural branches, neither will He spare us! If we do not continue in His kindness, we also will be cut off. Is this an idle threat that has no reality behind it? Does God really mean what He says? We must have a two fold view of our relationship to Jews. In Christ we are equal but outside of Christ we are not equal. Outside of Christ we do not belong and are classed as dogs instead of children. We must always remember that in the natural we have no place with the children of Israel. We were second class citizens. If God can graft us in, though being alien to Israel, surely He can graft the believing Jews in again. There is a remnant of Israel that has been saved and the rest were hardened. What a catastrophe! It seems like a hopeless situation but it is not. Though God is angry with His people, His hardening of them is not final. He has not finished with them. But as Paul says in verse 25, a partial hardening has happened to Israel. Yet it will not last forever. There is more that God has planned for Israel than this predicament that they are in. He means to fulfill the Old Testament prophesies about them. Look at Acts 1: 6 – 8. Some people read this scripture and say that the Apostles were arrogant. They claim that the Apostles were still caught up in their pro-Israel mindset and therefore Jesus had to rebuke them. They claim that the Apostles had not yet understood that it was not about Israel anymore. Rather they had to take the Gospel to the ends of the World; that being the final phase of God’s salvation plan. They believe that God has done away with any purpose for Israel as a nation. But look at what Jesus says to them. He does not say that they were wrong to ask about the restoring of the kingdom to Israel. He simply tells them that they should not concern themselves with the timing of its fulfillment. In other words Jesus was saying, ‘You are right, the kingdom will be restored to Israel BUT it is not for you to know when. Your concern is to be My witnesses.’ We are presented with a certain form of Christianity and we think that is the sum and total of what there is to be known and experienced. Much in scripture has been fulfilled but there are still other things that have not happened yet. What this should do is create a hunger in us to see these things come to pass. The salvation of the Gentiles is not final in God’s plan. After the fullness of the Gentiles, God restores the fortunes of Israel. After the fullness of the Gentiles, then all Israel will be saved. This cannot be a reference to all Jews of all times because Paul is adamant that many Jews of his day were not saved and not among the election. But rather we are talking about a moment in the future history of the planet. There will be a time when the Jews who are still alive, at the end of the Tribulation period, will be saved as a nation. Remember what Jesus said to the Jews after Palm Sunday, when they had already called out to Jesus, ‘Blessed is He who comes in the name of the Lord’. In Matthew 23: 39 He tells them that they would not see Him again until the next time they call out ‘Blessed is He who comes in the name of the Lord.’ He will fulfill the promise made in Jeremiah 31: 31ff that states the new covenant is made with the house of Israel and the house of Judah. This is a covenant where all the Jews will know God, from the least to the greatest of them, for God will remove their iniquity and sin. Paul quotes from Isaiah 59 and Jeremiah 31. I find that interesting because Isaiah 59 is the portion of scripture that Paul quoted from to say that there is none righteous. In other words Paul, in great depth and through 11 chapters, has just expounded what Isaiah has said in one chapter. That is, Israel has transgressed the law of God, they have become unclean but Messiah comes with a greater covenant and removes their ungodliness. This is how Paul understood the Old Testament scriptures. We see God’s treatment of Israel and we conclude the wrong thing, namely that God has finished with them. But we are ignorant of the fact that God has two attitudes to the Israel that rebel against Him. Verse 28 shows us that it depends on what way you look at it. From the standpoint of the Gospel they are enemies for our sake. That is, at the time of Paul’s writing they persecuted God’s house. They were the same as Paul was before he got saved when he wanted to silence the voice of God’s messengers. They were enemies to the Gospel. Therefore they were put under judgment. God has endured with much patience the vessels of wrath prepared for destruction. But there is another view point that God has concerning Israel and that is that He deeply loves them. It is from the view point of God’s election. Because God made a covenant with Abraham and God put upon Himself alone the obligation to uphold it, therefore, He cannot finish with Israel as a nation. The election is and always will be Israel. But God has separated a people for Himself and they are an elect nation. But not all Jews in Israel are of faith and have had a spiritual birth. Thus, they are cut off from their own election. But we Gentiles who believe are grafted in amongst the elect nation and by virtue of that grafting in, we are, therefore, elect. God, who is eternal is in relationship to us before the creation of the world, therefore, knew us before the creation of the world. And based on this foreknowing, He has predestined us. The election can never be taken away from Israel, why? Because verse 29 says clearly that the gifts and calling of God are irrevocable. Replacement theology is a lie and a perversion of scripture. God cannot do away with Israel as a nation because if He does then the scripture is a lie. So finally, we see God’s ultimate purpose in conclusion to this chapter. We used to be disobedient to the Word, just as the western nations were absolutely Pagan before the introduction of the Gospel, yet we obtained mercy. So Israel, being God’s election, have been disobedient so that God may also show mercy to them. If God showed mercy to those who were not His covenant people in their disobedience, then surely the disobedience of God’s own people will not deter Him from ultimately showing mercy to them. What is the point of all this? Verse 32 For God has shut up all in disobedience so that He may show mercy to all. Why does God harden Israel? So that He may show mercy to them. What was an experience of God’s judgment on humanity is actually the means of salvation to humanity. It does not make sense. If you want to save a nation, surely hardening them to the Gospel is not the way to go about it. It does not make sense does it? Yet it does to God. He sees it and He understands exactly what to do in every situation. He works all things together for a greater purpose than the salvation of Gentiles or the salvation of Israel and that purpose is this, the salvation of all nations, Jew AND Gentile. Think about all the ground we have covered in these last 11 chapters of this epistle. Remember all the wealth of insight that Paul has demonstrated concerning God’s salvation plan. Paul knows all about the gospel. He knows all about the condemnation of mankind. He knows all about the Law and about grace. He knows all about the typology of the two covenants in the Old Testament scriptures. He knows all about the promises of God to Israel and how they are to be fulfilled. He knows all about the use of the Gentiles’ salvation to provoke Israel to jealousy. He knows all about the restoration of Israel in the future. He knows all this and much, much more. Peter said of Paul’s writings that they are difficult and hard to understand. Paul’s mind was incredible and his knowledge exhaustive and yet what does Paul say in verse 33. He says in effect, ‘I know all of this but I cannot figure it all out. I know all this but my knowledge is nothing. I cannot search it out. I cannot fathom God’s ways. I do not understand why God does stuff the way He does.’ God alone is wise and verse 36 shows that He is the focus of everything. He is the originator of all things, He is the means of all things and He is the purpose of all things. Therefore, He alone is to be praised and if there is only one thing that we can get from this chapter, I hope it will be an awe and appreciation for God’s tremendous wisdom of His plan of salvation for the world.